"The IRS Association takes cognizance of and conveys its strong anguish and hurt at various statements being attributed to you which malign the image of the Income-Tax Department and its employees, blaming them for corruption in a generalized manner through media including various TV and FM Channels." “I was a Commissioner to Income-Tax. An ordinary I-T Inspector normally makes Rs 1 crore in a year. As Commissioner, I could have made crores and travel in a car fitted with beacon light. 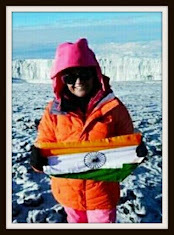 But I left service and decided to serve the nation,” said Kejriwal. (Source: Indiatvnews.com)"
"Your attention is drawn towards a radio message telling that you could have earned crores of rupees as commissioner of Income-Tax but you resigned and preferred politics. The above statement being attributed to you cast aspersion on the whole Department including every employee. The Association wishes to remind you that no department or organization is corrupt or honest; it is the individuals of the department or organization who may be so. The IRS Association strongly feels that corruption, whether in the Income-Tax department, or in any other organization or in politics, should be eliminated, but does not support defaming and maligning the entire personnel of a Department or organization. It needs to be emphasized that your wife is a member of this Department." "You need to be informed that the Income-Tax Department is a front-line Department of the Government of India who, by efforts of its personnel and aid of modern technology, has not only increased revenue mobilization manifold for the nation, but also introduced transparency to a great extent for better governance. The excellence of its computerization modules has been recognized and honoured with various national awards. The Indian Revenue Service is, therefore, is one of the best Central Services in the country today. In view of the above, we feel that the statements being made by you are unnecessarily damaging the image of this fine service." "In these circumstances, we request you to desist from and immediately stop making such statements in public and in print and electronic media; otherwise we will be constrained to take steps to protect our image." "To correct the facts, contrary to your claims, you have never worked as Commissioner and your batch has still not been promoted as Commissioner of Income-Tax." What is wrong in Kejriwal shortening his designation to Commissioner? While addressing crowds he has to use words which can register in minds of public. simple logic. 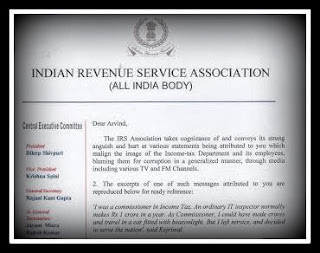 These officers who are crying hoarse and baying for Kejriwals blood at the behest of vested interests, please note the timing of the letter of IRS Association, are actually the first ones to compromise with the system. They start crawling if asked to bend. This has become a standard reply of Mr. Kejriwal everytime he is asked about " how do we know you wont become corrupt once in power " . He should watch his words. Mr. Loknath Mehra. Let me first tell you that this letter is definitely not at the behest of any vested interests. If it is at the behest of vested interests, the letter would have been much harsher and would have criticised Mr. Kejriwal. The letter does not in any way use any word which goes against Mr. Kejriwal or his party nor does it talk about any other party. THis is also a personal letter served on Mr. Kejriwal. It was not even released to the press. The IRS Association even did not ask for any apology from Mr. Kejriwal. IRS Association simply wants him to control his urge in using wrong words against any department in general. We want him to do well and bring good name to the country. But at the same time this growth should not be at the cost of some other individual or organization. The timing of the letter can be talked about only if it is released to the media. This is a letter written directly to Mr. Kejriwal, who was once part of the same family. I beg to disagree with you. First of all Kejriwal says he COULD have made crores of money as Commissioner of Income-Tax (CIT)and travel in a red beacon fitted car. He never said that all CITs are corrupt and resort to taking bribes, Second why should the IRS Association threaten him of steps if he refuses to stop his statements about the IT Department, based upon their perceptions (of Kejriwal's statements about the IT Department). When PM MS says and admits that there is massive corruption in India, none of the various government bureaucrats' associations send a threatening letter to PM MMS that steps would be taken by these various associations against him (PM MMS) if he does not mend his ways. This is sheer nonsense. Can any one in IRS, IAS, IPS, I*S, etc service say with a straight face that there is no corruption in the upper layers of bureaucracy? Thirdly if I*S officers are not corrupt, why is a formal Coal Secretary being charged and the case proceeding to prosecution? Another example, where are the IAS officers, vis-a-vis Haryana cadre officer Ashok Khemka who is being prosecuted by the government on trumped and falsified charges? The IRS Association letter is just crocodile tears! Have a good day Sir/Madam. I think its not just in the mindset of people that is has been widely accepted as a fact that top govt positions make all the money. There have been numerous instances. Bribes at each and every level in govt body has done so much harm to its image that whatever Arvind said seems just a fact that a statement. his " Anti - Corruption Ends "
and Sonia Gandhi has yet to regret her " Maut Ka Sodaagar " remark. Leave alone Congress / BJP leaders , publicly calling each other ,"Rats"
and " Monkeys " , since they know each other better ! gone from Rs 6 Crores to Rs 111 Crores ! Kurukshetra - the battle between the " Corrupt Masters " and the "
Oppressed People " , where " Good " will triumph over the " Evil " ! > Tsunami is about to sweep them into the dustbin of history ! Instead he could use Majority of people in IRS as disoriented ,corrupt and unbalanced who not only are corrupt but make the system below it also corrupt by means of fear in the mind. Kejriwal makes sense when he says this.Isn't? How can an inspector without any discretionary powers make money and that too in crores! I think Mr. Arvind Kejriwal should stop his act of trying to enhance his image by casting aspersions on others. I had posted a comment on this thread. But it was not approved by the administrator. I want to know the reason for declining my comment. It is unfortunate that Mr. Kejriwal played to the gallery to gain more acceptance and political mileage in criticizing his old department and that chose poor Inspectors. Assuming that each Inspector earns 1 crore per year, if all other are taken into account in that department there would be 1 lac crores corruption per year in that department. One should be more responsible in criticizing somebody in public life. indeed an employee of any deptt.always knows better about the rampant corruption prevailing in that deptt.than others.If Mr kejrival has talked about corruption in IT Deptt,the assocition should introspect and bring measures to stop it rather to threaten Mr kejriwal for speaking fm. heart.Even your peons are learning tricks fm u senior and junior officers.